U.S. Immigration Law, already complex and challenging, has been undergoing significant changes. The nation’s laws and immigration proceedings can determine whether a family remains together or whether they are broken apart; they can create dreams or destroy them. At Cramer & Anderson, we understand the importance and urgency of all types of immigration matters, and we work diligently and compassionately with clients every step of the way. Our attorneys and staff meet with clients in private settings and speak Spanish and Portuguese, easing critical discussions about the possibilities for each specific issue. We weigh the risks and benefits of each option and guide clients in choosing the appropriate path. Family Petitions for relatives within or outside the U.S.
Lisa M. Rivas, our lead immigration attorney, is based in the firm’s Danbury office. She has represented clients from across the world, primarily Latin America and the Caribbean. As part of her compassionate advocacy on behalf of clients on all types of immigration issues, Attorney Rivas has achieved successful outcomes in cases in which victims of domestic violence were facing deportation because they fled the abusive situations in their home country. Her practice includes experience with Special Immigrant Juveniles (SIJ) Status, the program designed to help foreign children in the U.S. who have been abused, abandoned, or neglected by one or both parents. She has been successful in fighting the deportation of immigrant children in such situations through asylum or SIJ proceedings. Attorney Rivas’s pro bono efforts have won her notable honors and awards, including a 2016 New Leaders in the Law award from The Connecticut Law Tribune. As a volunteer at the Hispanic Center of Greater Danbury for more than five years, Attorney Rivas teaches a citizenship course she made so popular it has gone from being offered once a year to four times annually. 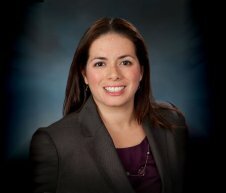 For more information about Attorney Rivas, see her profile page. She may be reached at (203) 744-1234 or by email at lrivas@crameranderson.com. Cramer & Anderson’s highly experienced attorneys also help immigration clients with a wide range of other issues they might be facing. On Workers’ Compensation, we know that understanding a client’s immigration status and/or their ability to work legally in the U.S. allows us to determine whether they can obtain certain compensation benefits. Our Divorce & Family Law attorneys can advise clients, for example, about how the terms of Form I-864, Affidavit of Support, affect couples and families, potentially entering the picture during alimony negotiations. When it comes to Criminal & Motor Vehicle Law, our attorneys realize that understanding a client’s immigration status is crucial in order to determine whether a conviction could result in inadmissibility, or result in the client being placed in removal/deportation proceedings.